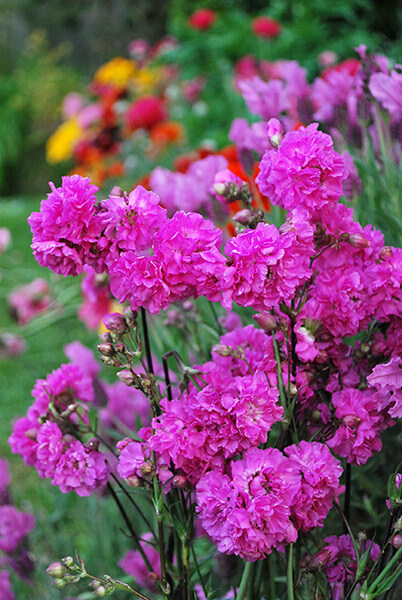 An easy to grow perennial offering a spectacular display of large, vivid magenta double flowers during the warmer months. The low clumping foliage is ornamental making a terrific 'filler' for small spaces and can be used to particularly good effect as an edging plant for paths and paved surfaces. 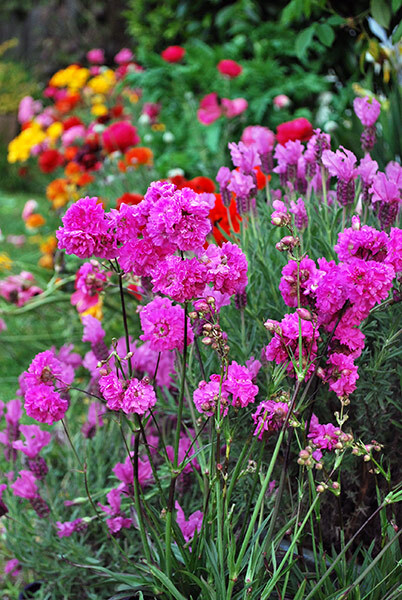 In a bed or border try planting a drift of 2-3 plants for real feature value. Also makes an eye-catching container specimen. Prefers a full sun location in most soil types given good drainage. Low watering requirements withstanding some dryness but should be watered regularly during extended periods of heat. No pruning required although trimming off spent flower stems will encourage a lengthier display. An application of a slow release fertiliser after flowering would be beneficial to overall performance. Can be grown in groups or individually for general garden use. Ideal for edging garden borders, pathways or paved areas. Can be grown in decorative containers for mobile colour. Flowers can be used in fresh floral arrangements or dried for floral crafts and pot pourri. Foliage is also attractive for year round interest.